Don't let the bright lights distract you, instead pull on these Oakley Latch OO9265 02 Sunglasses from Oakley. Designed with Oakley's three-point fit, this helps keep the sunglasses securely in place for precise optimal alignment. A patented innovation that ensures the frame makes contact only at the bridge of your nose and sides of the head. When it comes to the supremely lightweight frame, O-Matter™ brings a stress-resistant material that has been developed to withstand environmental extremes. Controlled flexibility enhances impact resistance while contributing to the all-day comfort. As well as looking and feeling good, UV protection is provided through the Plutonite® lens which filter out 100% of UVA/UVB/UVC and harmful blue light up to 400nm. 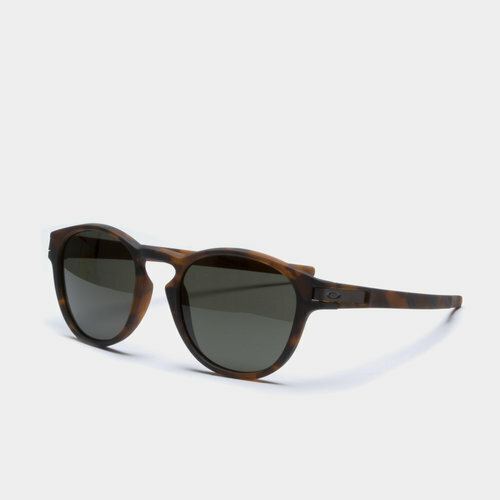 A matte brown frame includes the iconic Oakley logo for a stylish look. Complete with a Microclear™ bag for lens cleaning and frame storage.